raja and rani: Goodbye 2011! Phew, what a year it's been! 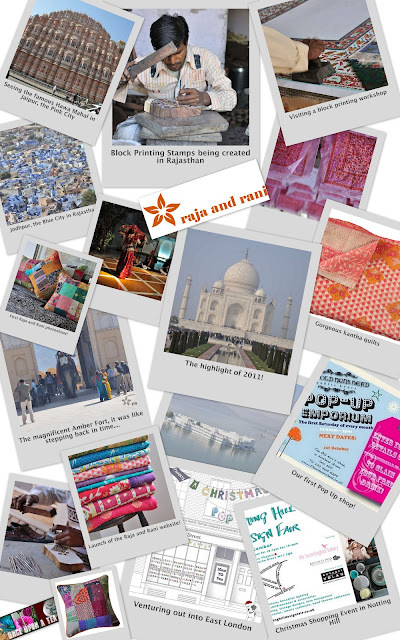 The best way to capture it was to create a collage of the last 12 months in the world of Raja and Rani. We've come a long way this year, from the adventure in India at the beginning of 2011, to sourcing the first collection, meeting our suppliers, creating the website, anxiously waiting for the stock to arrive, getting our products stocked in London shops, and finishing off the year with Christmas shopping events and pop up shops. We've had a fantastic year, it's been a lot of hard work but fun too, here's to a jam-packed 2012 full of new ideas, inspiration and of course new and exciting Raja and Rani products! A special "thank you" to all our friends and family who have helped us along the way.